Windows automatically highlights newest installed applications and program folders in the Start Menu. If you don't want that feature, you can turn it off by following these easy steps. On Windows 7 or Vista. 1. Right-click on the Start Menu and select Properties. 2. Select the Start Menu tab then click Customize. 3. 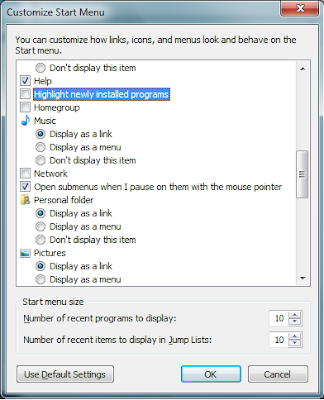 Now uncheck "Highlight newly installed programs" then click Ok.
2. Select "Start Menu" option then click Customize. 3. Then click on the Advanced tab and uncheck "Highlight newly installed programs", Click OK and close other dialog boxes.